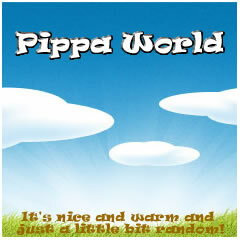 Pippa World: Why do I deserve to win a ticket to Britmums live? Why do I deserve to win a ticket to Britmums live? Why do I deserve to win a ticket to Britmums live? Well, Claire seems to think it's because I've been blogging for years and it's at events like these where we get to meet up and have a good giggle. There are hundreds of other bloggers who deserve a ticket to go to the event so they can meet up with other bloggers that they might not have met in real life. I've been blogging for years and in that time I've become fairly well known in blogging circles; For example Vic and I were in a lift before Cybermummy and two other bloggers got in the lift with us, asked if I was PippaD said how great it was to meet me and then got out at the next floor. I have no idea who they were, but they knew me! Of course I do know a lot of other bloggers and I love being able to say "Hello" to them as normally I think that they live in my computer but as much as I would love a ticket for meeting up with my friends, I don't think this is the reason I deserve to win a ticket. I've been very lucky to have won three national awards for A Mothers Ramblings, (Two MAD's for Family Fun and Best Mummy Blog at the Gurgles) so you might think that I pretty much know everything about blogging that one could know. It's not true, there is still tonnes for me to learn and I'm trying to! There are going to be sessions at BritMums Live that I would love to go to that would help me increase my knowledge and give me starting points on new things that I want to learn and try. There are going to be talks that I would love to hear, questions asked by other bloggers that I would never have thought of and a chance to hear what others think. It's not greedy of me to want to win a ticket, I can't afford one and those whom I've approached about sponsoring me have not had the budget. Partly I do think that this is why I deserve to win a ticket. I want to learn, I want to improve and it's this knowledge that I pass on to others. The other reason as to why I want to win a ticket? I want to be able to come home to a clean house, with fed children, the laundry washed, folded and put away, a nice meal cooking and hopefully something nice cooking for me. That's right whilst I'm away I'd love my husband to do my job, because he is much better at it than me. Of course if sponsorship was offered (£300-£400 to cover tickets, transport and accommodation) there would be advertising space here and on AMR offered in return and of course mentions in write ups about the day... I could even add an advert to my new TV Channel (I know right?!) and when I finally get back round to doing my podcasts they can be name dropped there too. I don't think it's a bad deal. I really hope you get picked hun, it wont be the same without you. You are so right, we can all learn something, however long we've been blogging. You're so kind Claire you really are.